It has been in the single digits this week in Pittsburgh. That is way too cold for me, and really makes me want to hibernate until the sun is shining and I can actually see the grass again. This means I'm spending a lot of time in my pajamas, with a comfy blanket, watching Netflix or reading a good book. 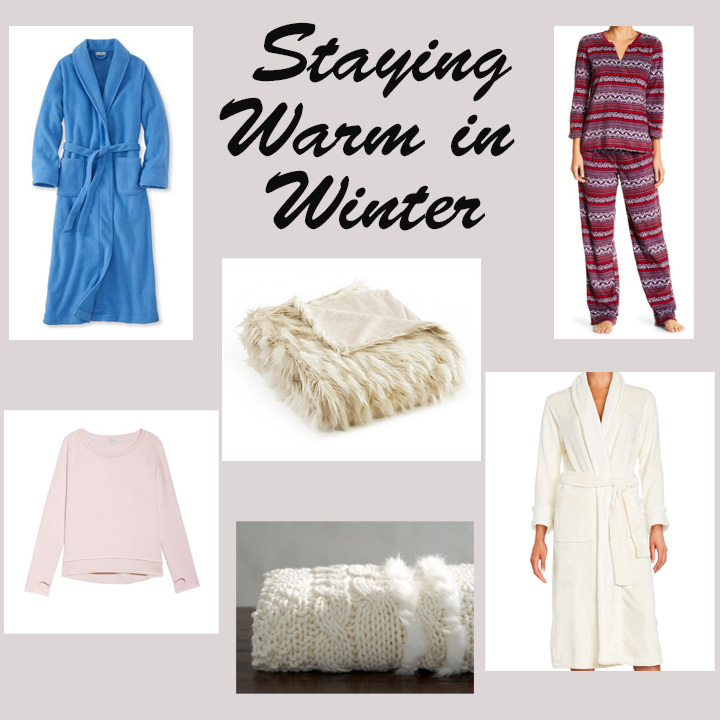 I wanted to share some picks to help you stay warm in the winter, too! When you're relaxing at home, it's so important to be comfy and cozy. A warm, soft blanket is key when you're relaxing at home. I just got a great faux fur blanket, similar to this one, for Christmas, and also have a cable knit one similar to this (I like options)! Both are incredibly comfortable and keep me nice and warm. In the winter, PJs have to be comfy and warm. I love that these pajamas are fleece, because I'm not a big fan of flannel PJs. And if you're looking to add another layer, this cute fleece sweatshirt looks perfect! I'm not a big robe person because it's not easy for me to get one on, but I totally see their benefit for other people. Both this option and this one are long and soft, and are perfect for throwing on over your pajamas and lounging around. What are your favorite things to cozy up with during the winter?